Southeast Asia is one of the most popular destinations for backpackers. It's easy to travel through, and the region is generally very cheap and budget-friendly. The food is amazing, the temples are beautiful, and there are so many activities to get involved with. From zip-lining in the jungle, hot air balloon rides, kayaking, caring for elephants or riding scooters through lush paddy fields - the choices are practically limitless. No matter what your interests are, there's something in SE Asia for everyone. However, with countless places to see and things to do, if you're limited on time (and/or money!) how do you decide where to go? Kuala Lumpur is the capital city of Malaysia, and is a great starting point for any first-timer visiting Peninsular Malaysia. The city is vibrant with several well-known tourist attractions, including the world-famous Petronas Towers. It's also famous for being a shopaholic's heaven with its impressive shopping malls and markets. Kuala Lumpur has one main international airport with two terminals, KLIA1 and KLIA2, which are connected via ERL's high-speed train. Getting into the city centre from either terminal is incredibly easy, and takes just under 30 minutes via the express train. Once you've reached the centre, visitors can then get around on foot, hop in a taxi, or use the monorail to get from place to place. Bordered by Thailand, Laos and Vietnam, Cambodia is a firm favourite on the South East Asian backpacker route. With cheap, frequent bus services and affordable hostels, Cambodia is easy for travellers to visit. It's a country rich in culture with plenty of history to learn about, and Cambodian beaches and islands could easily rival those of Southern Thailand. If that wasn't enough, it's also home to the eighth wonder of the world - Angkor Wat. It would be impossible to explore an entire country in the space of one month, let alone nine days. 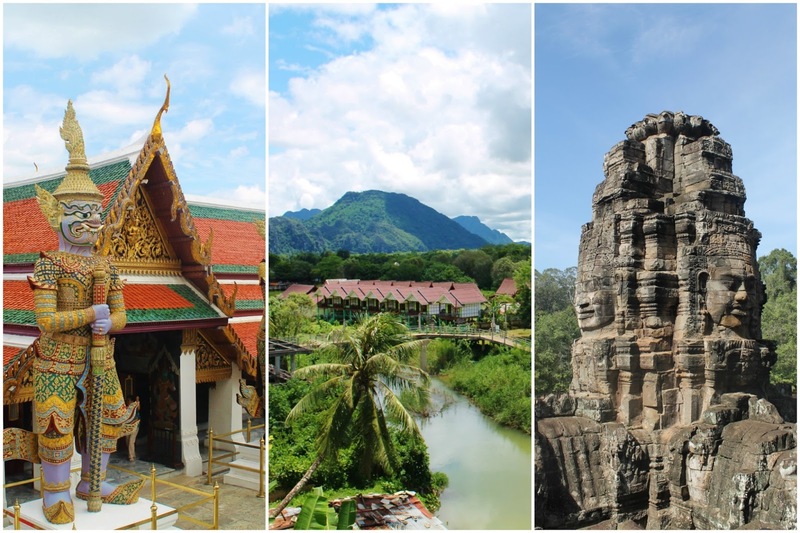 However, this itinerary covers most of the highlights including the temples of Angkor, the Khmer Rouge Killing Fields, Sihanoukville and Koh Rong Sanloem island. It starts in Siem Reap and finishes off in Phnom Penh, the capital of Cambodia. Siem Reap is best known for being the base town for visiting the temples of Angkor, the eighth man-made wonder of the world. Most visitors only stay for a day, explore the temples, and then move on. However, Siem Reap has plenty of other things to offer those who choose to stay a little longer. Siem Reap is a small town in the north-west of Cambodia. As a popular stopping point on the backpacker route through SE Asia, it has a whole host of budget-friendly hostels and hotels to choose from. There are also plenty of amazing cafes and restaurants serving up traditional Khmer cuisine. It's often a misconception with people that you need to be rich to travel the world. Let me tell you now... you don't have to be a millionaire to travel! You also definitely don't need to have wealthy parents that will fund your travels either. Instead, you simply need to be willing to work hard and make a few sacrifices in other aspects of your life. You'll be surprised at how easy it is after you start! I've always been good at saving. I started saving for my first car when I was 16 by working throughout the summer on a farm. I then saved for my three-month backpacking trip around Central Europe and Asia by putting money aside from my internship and scholarships whilst studying at university.